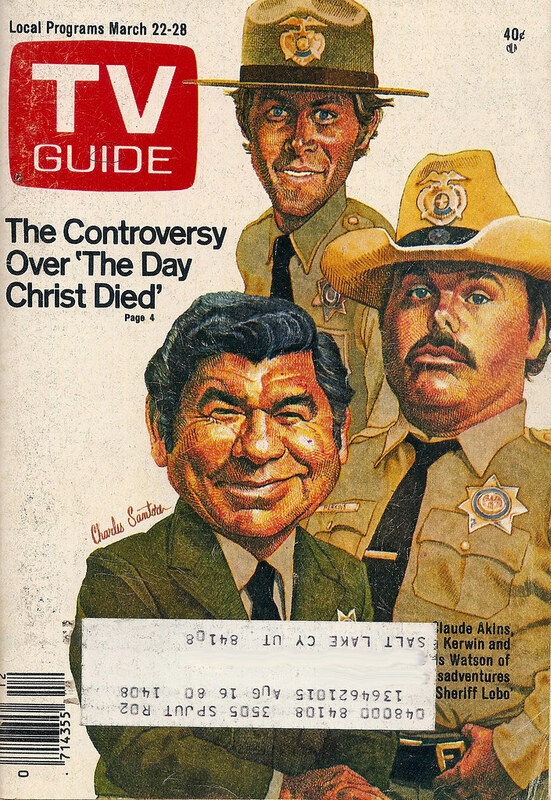 Is it just me, or does "The Controversy Over 'The Day Christ Died'" strike you as hilarious juxtaposed next to the gang from Sheriff Lobo? Yes, I know. You'd think with Retrospace in hibernation for a year, I'd be bursting at the seams with a variety of retro topics. 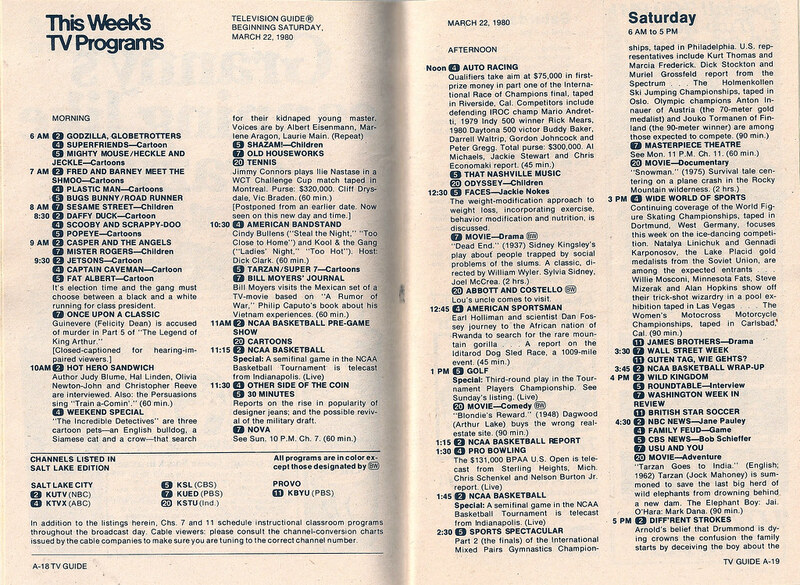 Yet, here's yet another TV Guide. I can't help it - I've got a box of these, and they simply must be shared! Kids today enjoy several channels with 24 hour children's programming. Back in the day, we were limited to this paltry allotment. I mean, by lunchtime, your pittance of kiddie shows were over.... for the rest of the week! 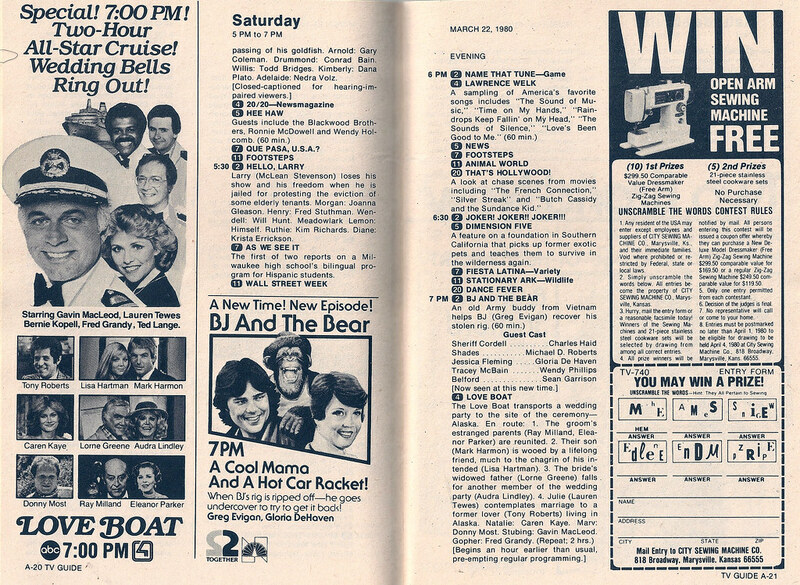 You hear a lot of Gen Xers wax nostalgic over their precious Saturday mornings. Yet, how pitiful it looks on paper! ...this meant that, for the remainder of the week, kids were watching programming not necessarily aimed at their age group. This meant, we were watching BJ and the Bear, Love Boat, and (choke) Hello, Larry! I say this without any sense of hyperbole - there is no better pop culture time capsule for young Gen Xers than "Kids Are People Too". The guests on the show were a who's-who of a young generation's pop icons. I distinctly remember watching with rapt attention Stan Lee describe how he invented The Hulk. Then there was Debbie Harry, Scatman Crothers, Ace Frehley, Cheap Trick, Brooke Shields... and in this episode - Judy Blume! 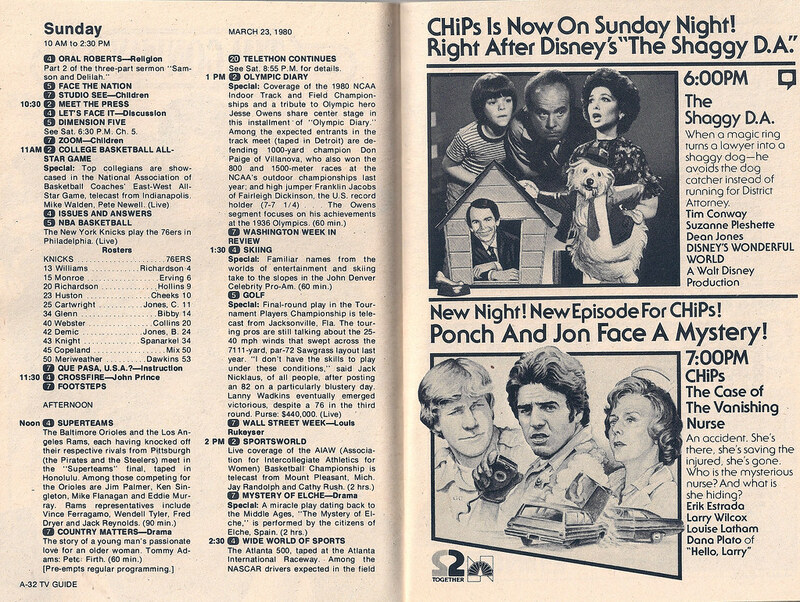 Tonight's episode of CHiPs starring "Dana Plato of 'Hello, Larry'"... soon to be of "Diff'rent Strokes" and soon to be holding up stores for drug money. Not funny - truly tragic. "Those jerks were the first put me away! Now I'm gonna put them away!" Ben Vereen and Jeff Goldblum don't seem particularly threatened. Add this Ryan's Hope ad to the ever-growing Carry List. 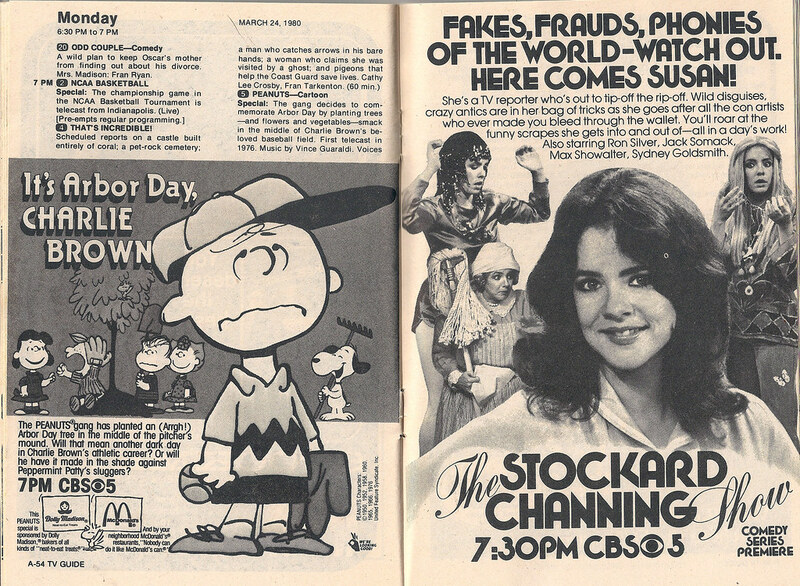 The new Stockard Channing show stars Max Showalter (Lord Love a Duck), so you know it's good. "Doctor Zhivago" up against the "Flo" premiere. I wonder who won in the ratings. "The way to crush the bourgeoisie is to grind them between the millstones of taxation and inflation." This was the weekend of the 1980 NCAA Final Four. 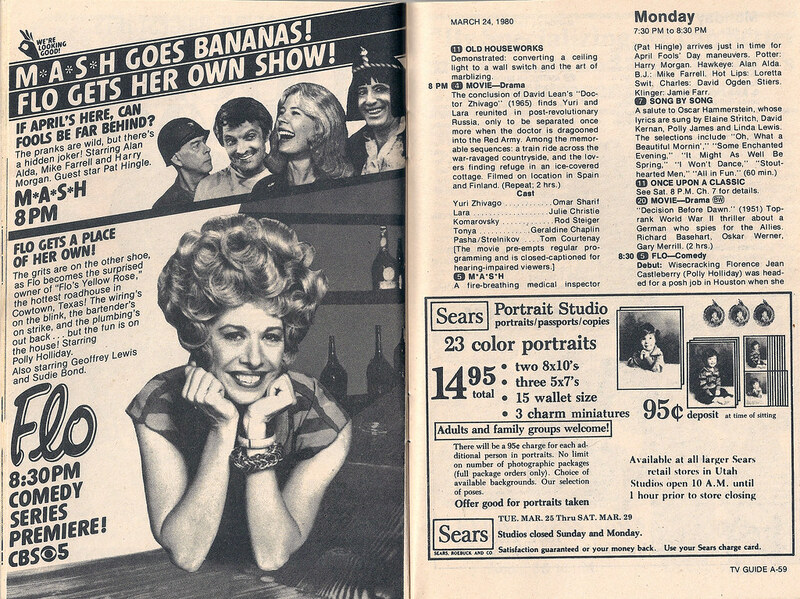 The first semifinal game on NBC was up against American Bandstand and the second was up against CBS Sports Spectacular and ABC's Wide World Of Sports. The final was on Monday, March 24 on NBC. Now the tournament stretches into April on CBS, TBS, and two channels that hadn't existed yet, TNT and truTV. 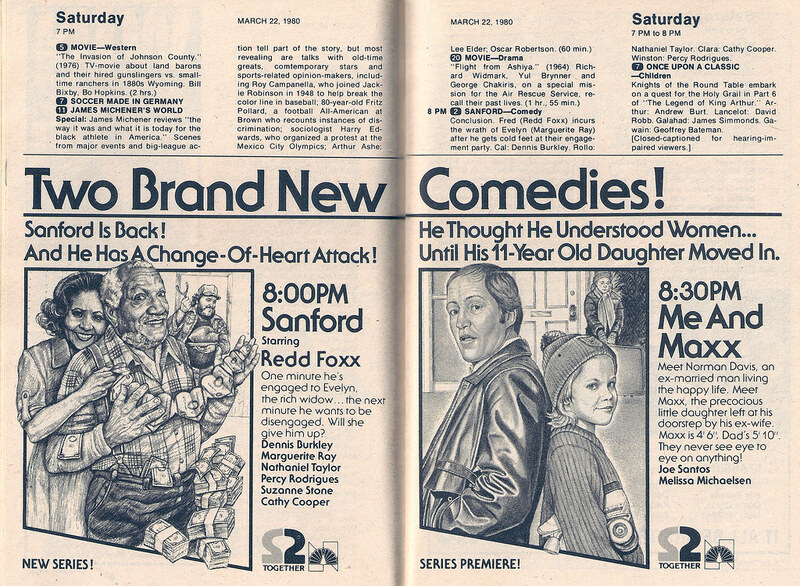 I think TV Guide added cable listings sometime later in the 80s. If you grew up in southwest Missouri, like me, half of the Saturday morning shows were preempted for coach's interview shows or sport broadcast in general. 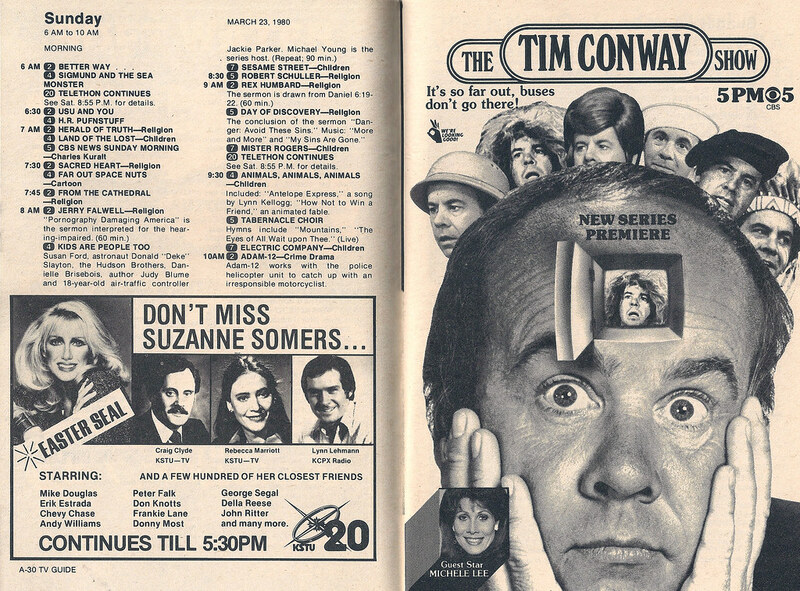 The thing I remember about the Tim Conway show is a sketch where is "tries out' a hot tub in a showroom with a prissy spinster. He tries to act real cool in front of this woman. Instead (I'm not making this up) farts loud and produces a bunch of bubble. I think this aired after Johnny Carson showed that commercial from Japan where the kid does the same thing in a communal bath. i hope to find it on YouTube one day. Wide World of Sports had decent programming that Saturday; trick pool shots and women's motocross. Now it's 24-hour football, basketball, baseball, and NASCAR for the braindead populace. BTW, Suzanne Somers' makeup really didn't translate well to halftone print. Her cheeks are quite scary. In Nebraska, the coaches' shows aired on Sunday nights at 10:30 after the news. Tom Osborne and whoever was the sports guy at the time would give the highlights of Saturday's game. During basketball season it was the same, Sunday at 10:30. Now it's the coach's show that airs at 10:30, followed by a general show about Nebraska's other sports programs. 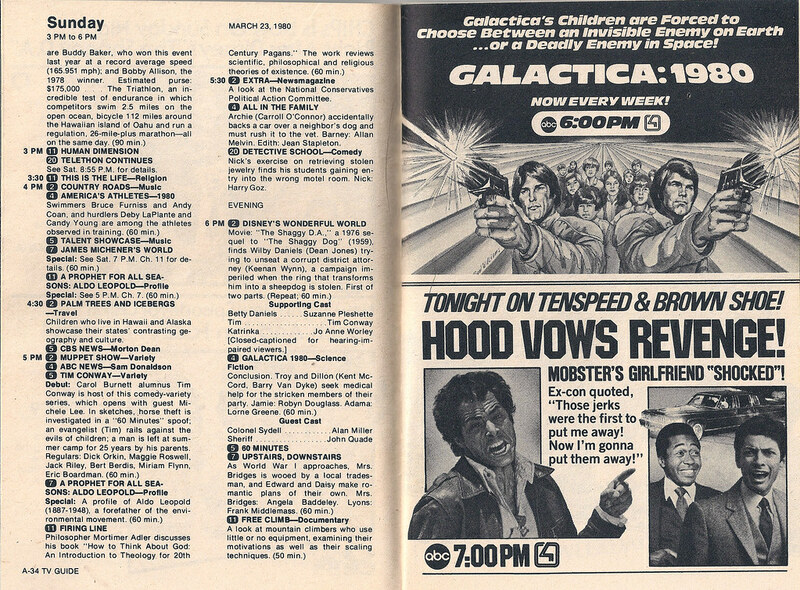 Galactica 1980: Now Every Week! But Not for Long! John Ritter was part of the co host on the UCP Telethon for 17 years until his death in 2000.